JetBlue is the latest example of a brand using a creative live initiative to stand out from the pack. I’ve written about hundreds of marketing and PR campaigns over the last four years, and while some have been etched in my memory, the experiential marketing events I’ve attended always leave a permanent imprint. 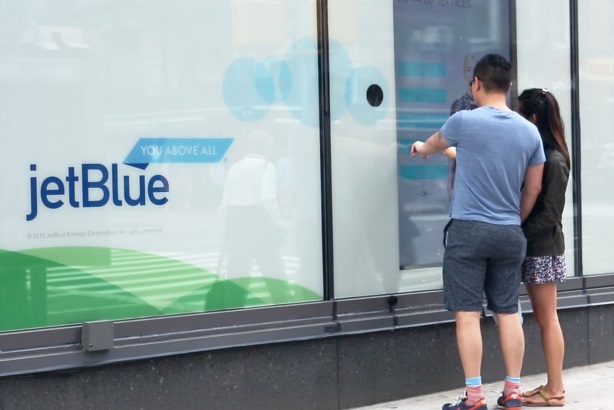 Last week, I read about an on-the-ground activation from JetBlue, where the airline set up a virtual storefront window display in New York City and surprised people by having a seemingly digital crewmember come out from behind the glass to interact one-on-one. The effort, created with Pearl Media and Mullen Lowe US, followed JetBlue’s Shades Up interactive game installation in Aventura Mall near Miami last month, which invited customers to play for a chance to win two round-trip tickets to anywhere the airline flies. Anthony Petrillo, senior EVP at Pearl Media, tells me that more than 17,000 people played the game in one week and about 18% gave their email addresses, providing JetBlue with more than 3,000 new contacts. Petrillo says he’s noticed that brands are taking experiential marketing more seriously and spending more money on it. "We’ve been in this space for eight or nine years now, and the amount of requests that we get really hasn’t changed dramatically, but the caliber and quality has," he says. "People are coming to us with actual earmarked budgets and very direct goals." According to Event Marketing Institute’s 2014 EventTrack Executive Summary, the average event budget among leading brands increased 5.4% compared with 2013. The decision to spend more on events could be triggered by brands trying to get consumer attention away from social media and advertising. An overwhelming majority (93%) of consumers in EventTrack’s survey say events and experiences are more effective in helping them understand a brand’s services than a TV commercial. Petrillo thinks it’s difficult to create an actual emotional attachment with people through an ad, but with an experience, a brand can separate itself from competitors by promoting its culture and lifestyle. While engagement and relationship-building are important, so are business results and ROI. The EventTrack survey states that 78% of brands say they measure their event programs, while 59% have a formal ROI-tracking model in place. After talking to several industry executives in the experiential marketing space this week, it seems like metrics and measurement tools to track event results are getting more sophisticated, but they still need a bit of work to determine actual sales. Social media impressions, earned media, and coupon use reign in this area for now, which is nothing to scoff at since events are key for building word-of-mouth buzz. IQ Media has also benefitted by tracking specific event coverage across print, broadcast, online media, social media, blogs, forums, and review sites. Courtney Engel, VP of PR at Grey Activation & PR, says experiential marketing is powerful for consumers because it creates a more memorable experience than just purchasing an item. And on the brand side, events can increase consumers’ purchase intent, brand affinity, and loyalty. Experiential marketing is just as important on the media side, according to Engel. She says that media are "inundated" with press releases and event invites, which is why it’s crucial for brands and agencies to develop unique, immersive experiences for media, rather than just the typical launch party. In September 2013, I attended Canon’s PIXMA PRO City Senses Gallery, supported by Grey PR & Activation, where members of the media were invited to use all five senses in a fun, interactive way. It’s been almost two years since that event, and I remember everything about it because it was different. While inviting media to events may not lead to editorial coverage, Engel says building relationships with reporters and having them potentially post something on their social channels is still a win. Michael Olguin, president of Havas Formulatin, tells me that his firm breaks its event marketing into two categories: low volume, high touch, which is more experiential and shareable; and high volume, low touch, which is focused on product sampling. Formulatin will likely do more than 30,000 events for its Heineken portfolio this year, says Olguin, which will be a mix of sampling-centric and more memorable experiences. One caveat on experiential marketing: brands shouldn’t host events all the time. The experiences should be relevant, authentic, and special, and they should be communicated that way to consumers and media. Leaving a little intrigue about the event while teasing it is always a nice way to build excitement and buzz, too. After a long day of scrolling, tweeting, posting, and staring at screens, going to an event and having a tangible experience with a brand can really make it unforgettable.